The church at Chelmsford was formed in 1802, and a short history published in 2002 gives a lot of interesting information. Its first building was in Duke Street, near the station, opened in 1803. The present building, in New London Road, was opened in 1848, and is Grade II listed. Between 1802 and 1980, 16 different pastors served the church. After a 25 year gap, Dr David Cassels became the pastor in 2005. I was first taken to the chapel as an infant in 1938. There exists an early picture of me in the chapel porch on the occasion of the wedding in 1939 of Leslie and Daisy Ransome. Daisy is the only person from those days who is still a member there, though she has moved from the area. In the picture, I am on Nanna’s lap – she was my guardian from June 1938 for about 10 years, following my mother’s death. Half-way up the wall, to the right (as you look at it) and level with the pulpit desk is a black metal grill; a rather small amount of heat used to emanate from this in the winter, from a coke fire lit in the vestry behind. I was still fairly young when this was replaced by two Tortoise stoves (motto “Slow but sure”) in the chapel itself. A caretaker was employed to get up very early on Sunday mornings to light these coke-burning stoves. There is a gallery at the back, although I have seen it used only a very few times for “great occasions”. Most of what I have described remains the same today, although the organ has helpfully been moved to one side, and a couple of pews have been removed from the back, providing space for the disabled, and easier access between the two sides of the chapel. A modern heating system has been installed, and major improvements have been made to the vestries, toilets and the Sunday School hall. Before Pastor Goodge, Robert Hewitt, had served 1920-32, and an affliction to his voice made it necessary for him virtually to give up preaching. He was still around in my young days. His son, John Calvin Hewitt, was a deacon, shortly before whose birth, “Pa” Hewitt had embraced the doctrines of grace, and commemorated it by thus naming his son. It was a particular pleasure to meet up with Calvin’s three children at the welcome meeting for Chelmsford’s new pastor, David Cassells, on 2 July 2005. Of the people I spoke to, I guess that Peter, born c. 1928, had the longest connection with the chapel. He had come from Stowmarket; his sister, Margaret Knight, still lives locally, and his brother David had travelled from Smallfield, Surrey. During World War 2 and the years immediately following, almost everyone came to chapel on foot or by bicycle. It was a notable event when Fred and Lydia Knight acquired a car of 1934 vintage, kept beautifully for many years. There was a bike shed behind the Sunday School hall, and men and women, many wearing hats and Sunday best, arrived in this manner. The manse, about 10 minutes walk away, made bikes less necessary for the pastor’s family. We used to sing, rather slowly, from Gadsby’s Hymns, and it was an innovation that Gospel Hymns was introduced in, I think, the 1950’s. It remains in use at Ebenezer today, as do hats, though bikes are a rarity. The privet bushes have largely been cleared from the grounds to provide parking space for cars in front of the chapel. When I was very small, I was often cared for by my other Grandma during service times. But when I went to a service, it seemed to me that sermons were very long and incomprehensible. Some of the men, especially those who preached, adopted “black and stripes” – a black jacket with black trousers with white stripes – as a kind of uniform. They were friendly enough, but it was really only in Sunday School that there was any teaching at child level. There, the forms on which we sat were spartan in the extreme, and a proposal in the 1960’s to replace them with chairs went ahead, despite the objection from one teacher – “I’ve taught in this Sunday School for 47 years, and we’ve always sat on these forms”, and for this reason, apparently, a change seemed undesirable. One of the younger musicians, Marcus Knight, encouraged me to learn to play the organ, and, when I was 16, I was assigned to play for all 3 services at the Sunday School anniversary. God’s word spoke to my heart that damp June day through Pastor Alfred Wade, and it was as a believer for the first time that I accompanied the final hymn of the day, ‘The day thou gavest’. Joseph Hewitt, 23 at the time, became the pastor later that year; he baptised me, and spent considerable time talking to me and helping me become established. National Service took me away from Chelmsford in 1956, followed by a time at London Bible College. So I have not been part of the Chelmsford scene for almost 50 years, except for a “gap” year in 1959/60. It was sometime in the early 1960’s that the chairman at a rally in London welcomed the speaker, missionary John Appleby, as coming “from the fringe of things, in Chelmsford”. He was alluding to the former area of the Metropolitan Association of Strict Baptist Churches, which was a circle of 30 miles radius around London. John, with his Essex man’s deadpan expression, said he regretted the chairman’s grievous error. Far from being on the fringe of things, he said, “Chelmsford is the centre of the world”. Memories of this are deeply in the collective consciousness, and allusions to it have cropped up in “Grace” magazine from time to time. 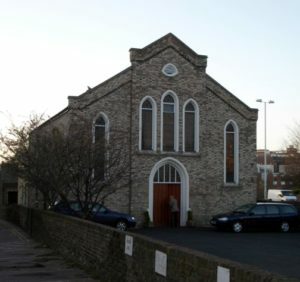 John, now retired, was taken to Ebenezer Chapel in Chelmsford in 1925. His cousin Olive Knight was sent from the church there to India to serve with the then Strict Baptist Mission, and after a few years’ pastorate at Wood Green, John followed in 1952. Their Aunt Ruth Appleby had served one term there between the wars, and most probably prayed for them. They were teenagers when I appeared on the scene as an infant in 1938. Stephen Toms, as senior deacon, has carried much of the responsibility of leadership during the 25-year interregnum, 1980-2005, with devoted support from his wife Jean, their children, and various other brethren. He is a staunch defender of Gospel Hymns, and of the exclusive use of the Authorised Version of the Bible. The new pastor’s welcome meeting, with a capacity attendance, lasted three hours, with preaching from Brian Green and lan Paisley. Their long association with the work is through its affiliation to the British Council of Protestant Christian Churches. This is the common ground on which the church has met Dr Cassells, who, until recently, had been ministering to a fellowship at Stewarton, Ayrshire. Mountains of homemade sandwiches and cakes were provided at the end. Mr Toms had told the preachers not to worry about the time, and if, when they finished, it was too late for tea, we should have to have it for supper. It was good to be back; I owe a lot to the rock from which I was cut, and the quarry from which I was hewn: (see Isa. 51:1). So there is something still of “home” about Chelmsford, and I have no complaint about its designation as the centre of the world.